You have spent days searching through online job postings. And jackpot! There are a few positions you qualify for. You’ve spent hours writing your resume. But you don’t think it’s exactly what you need to land that job. Or you’re stuck on the first section of your resume and you’re beyond frustrated. Writing a resume is no easy task! It’s hard to portray yourself in one to two pages. It’s even harder to make sure that what’s on those pages is what employers are looking for. Do you want to learn how to create a good resume that lands you a job? Read below for 8 tips you’ll want to use to create a good resume! Many people underestimate the importance of knowing how to create a good resume. We want to make sure you understand just how powerful a few pieces of paper can be! Let’s look at some resume statistics. Recruiters spend 3.14 minutes reading a resume. Within the first minute, a candidate’s worthiness is determined. These statistics prove the importance of a quality resume. Now let’s discuss how to create a good resume. 1. 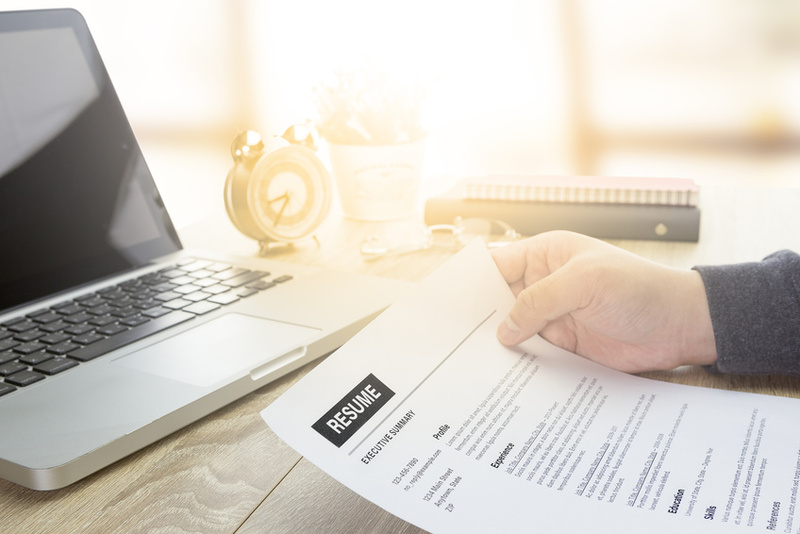 Are you using the correct resume for you? Believe it or not, there are two distinct types of resumes. But do you know how to create a good resume that is best for you? Odds are you have automatically created a chronological resume. This type of resume is the most common and offers a detailed listing of work experience and history. Is your resume a bit bare? Are you lacking details in work experience? If so, a functional resume is more suitable! This type of resume highlights abilities rather than work history. It’s easy to look over the small details, but with a resume, the small details matter! Before sending your resume to a potential employer, double check all information. Did you include that certificate you earned last year in the education section? Are the dates for your employment history correct? Inaccuracies on your resume can be costly. Take the time to check and double-check! Your resume is compared against dozens, if not hundreds of other resumes. This means your resume not only has to read professionally, it has to look well put together. It also has to be unique. In order to create a good resume, you can’t skip over proper formatting! Embrace white space. A page full of words from margin to margin is not ideal. Our eyes like white space! Don’t leave sections blank. If you do not have information for a specific section, remove it entirely. Have a consistent style. Your resume should be consistent. This includes using the same font, text sizes and colors throughout. Be sure to use headers, subheaders and bullet points! Keep it short and simple. A resume longer than a page may be skipped. Remove fluff and get to the point, quickly! Grammar and vocabulary are important. Employers aren’t likely to continue reading your resume if it doesn’t make sense. They also won’t read it if it includes typos. It can be easy to fat-finger a word. To avoid all of these mishaps, the fix is to edit your resume. But this doesn’t mean reading it on the computer once and then sending it off. Look at it how a recruiter will see it. Read it out loud. Does it make sense? Do the words flow? After you have edited, it’s time for round two! Ask someone else to read and edit your resume. The more eyes, the better! A resume that is well-edited shows you care about the jobs you apply for. With a resume, words are all you’ve got! Aside from being concise, your words must also be powerful. Did you create a website or did you design and develop it? Did you write a training plan or did you author it? The words used on a resume, especially verbs, may make or break your chances of getting an interview. Re-read your resume and pinpoint any weak verbs. Once you’ve found them, replace them! To create a good resume, always incorporate strong verbs. During your job search, what keywords did you search for? Are those keywords in your resume? Think of your resume like a search result in Google. Recruiters typically search resumes for job keywords. For example, if the job is for a web developer, your resume should include that keyword. This goes for any job type. Without keywords, your resume will never appear in the search results. Recruiters also look for these keywords to quickly determine if you are a good match. On a paper full of words, numbers jump off the page. Including statistics in your resume sets you apart from the rest. Did you increase sales by 20% after implementing email marketing? Were you able to increase website traffic by 30% after a redesign? Recruiters will remember that you did something measurable. If you’ve been working for 20 years, you have tons of work experience. But does all of your experience apply to the job you’re seeking? The more work experience you list, the longer your resume becomes. Remember, your resume should be no longer than two pages. And while you may want to showcase yourself from job one up until now, it may be a disservice to do so. Everything on your resume needs to be recent and relevant. As your career-path grows, your resume will grow with it. Anytime you change a job or switch fields, you’ll have to update your resume! Resume creation is not a one-time thing. Your resume follows you until the day you retire. Take the time to create a good resume and you’re opening the door to a strong career! Contact JDB Search Group to learn about our position placing services.